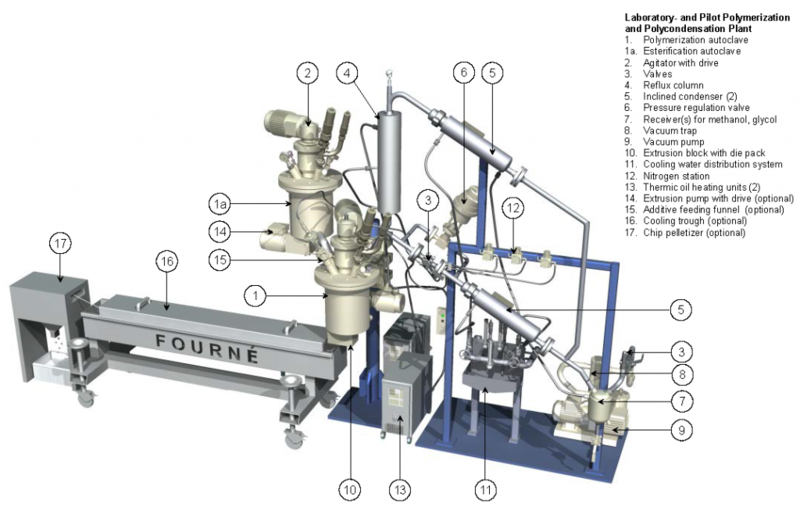 Fourné Polymerization and Polycondensation Plants are suitable for a batchwise production process of polymers. The equipment for both processes shows only small differences. The polymerization is made by addition of basic molecules (monomers) whereas the polycondensation additionally generates by-products, e.g. water or glycol, which need to be removed from the process. Furthermore the polymerization process can be executed in a solution, a dispersion or in the molten state, while the polycondensation is mostly made in melt. Typical products are e.g. : Aside from raw materials and catalysts the processes are only different in process parameters, i.e. temperature curve, pressure, vacuum and cycle time. Finally the discharging of the autoclave will also be different. A dispersion precipitates and can be decanted, a melt has to be extruded and should be pelletized for later handling.